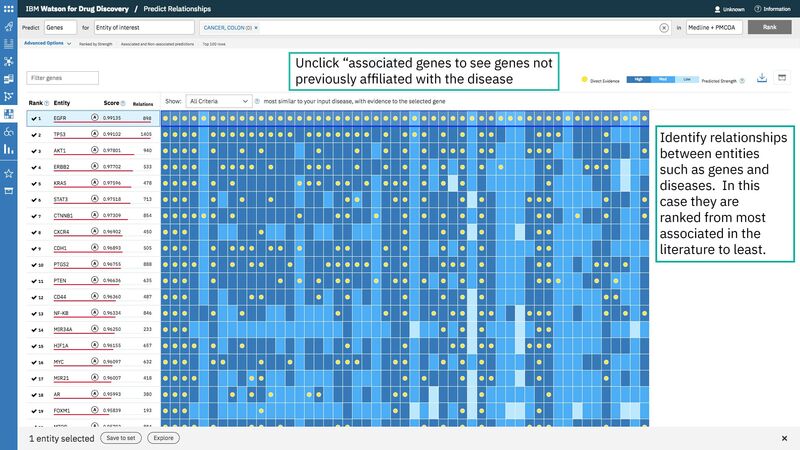 Watson for Drug Discovery reveals connections and relationships among genes, drugs, diseases and other entities by analyzing multiple sets of life sciences knowledge. Researchers can generate new hypotheses using the resulting dynamic visualizations and evidence-backed predictions. Watson for Drug Discovery delivers a cognitive platform and natural language processing trained in the life sciences domain. This AI-based approach lets Watson for Drug Discovery sift and analyze the massive knowledge base more comprehensively and faster than simple search tools or unaided research teams. Watson for Drug Discovery is cloud-based. As life sciences knowledge sources are being constantly updated you will stay current with them. Always use the latest version of the product and its application enhancements. Pharmaceutical companies, biotech and academic institutions use Watson for Drug Discovery to assist with new drug target identification and drug repurposing. Connect your in-house data with public data for a rich set of life sciences knowledge. Shorten the drug discovery process and increase the likelihood of your scientific breakthroughs. 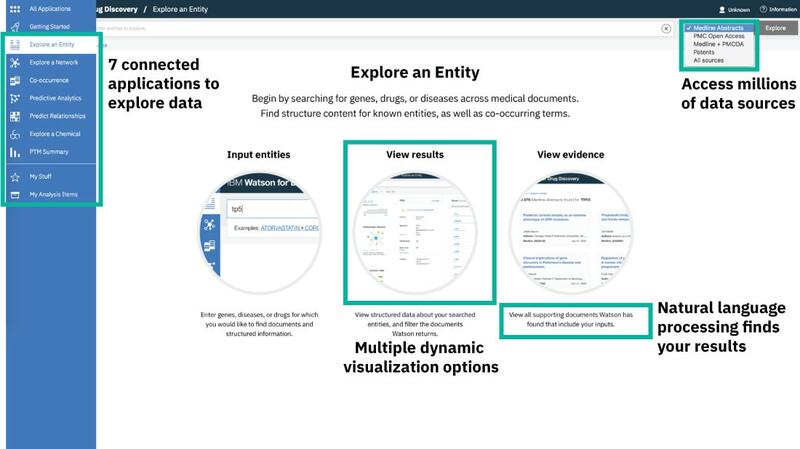 Watson for Drug Discovery has seven modules that mirror the questions, steps and processes researchers follow in a drug discovery process. Researchers start with a candidate list, such as a group of diseases, compounds, genes, or drugs they’d like to narrow down for further testing. Watson for Drug Discovery helps predict or define relationships among them through the various modules. Depending on your research project, you may use one, two or all modules at different times and multiple ways. The modules are different, complementary lenses on a core central repository of knowledge from millions of medical articles, abstracts, patents, drugs, conditions and genes/proteins. 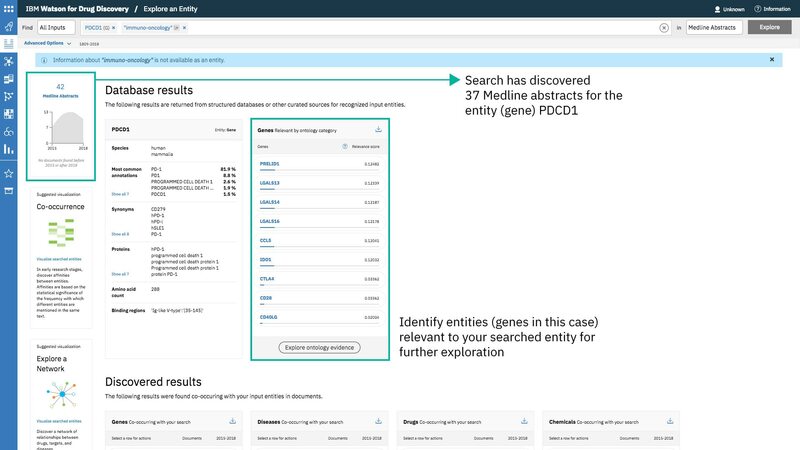 You may also connect your own proprietary knowledge stores to Watson Drug Discovery for analysis. 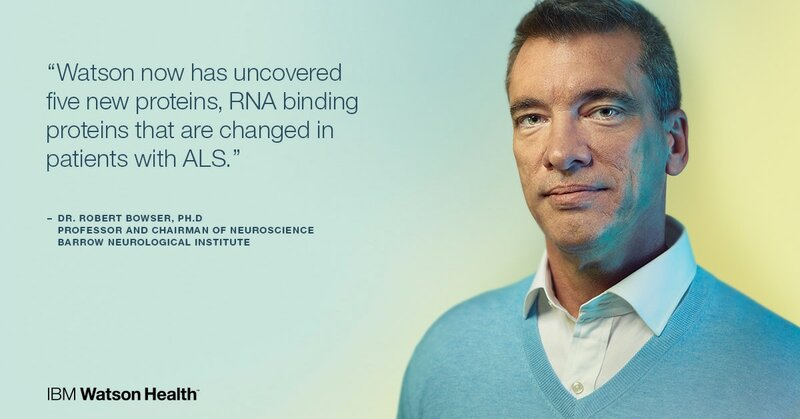 The IBM Watson cognitive platform, trained with healthcare and life sciences knowledge, uses natural language processing to understand contextual meanings in this wealth of data and identify connections. This cognitive platform can also help generate new hypotheses by predicting potential relationships not already known. Results come as interactive visualizations that show the connections and relationships. These dynamic visuals help you make sense of large volumes of data and detect the signal in the noise to generate new insights. Synthesize massive datasets in both tabular and text-based formats to suggest insights at a scale beyond what is manually possible. Connect your data with public sources to bridge data silos. The Watson Cognitive platform leverages machine learning to evaluate your data without bias. It learns through reasoning algorithms and generates new hypotheses for further evaluation. 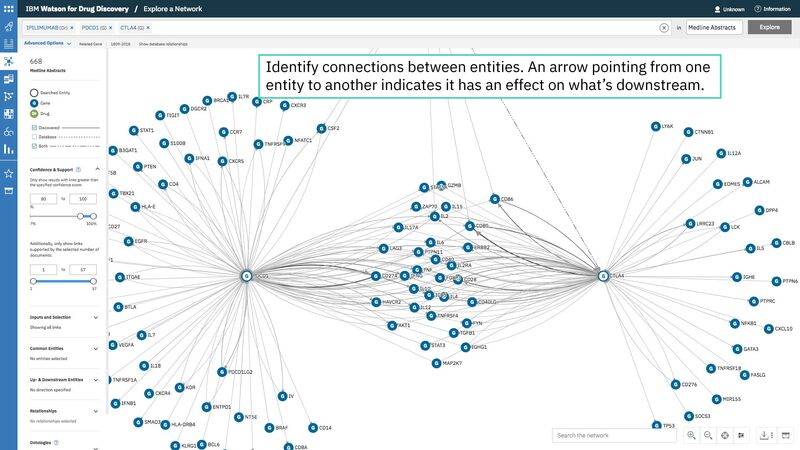 Dynamic visualizations help researchers see connections, identify properties of interest, and quickly drill down to supporting evidence. Shorten the time to drug discovery with better initial targets. Get all the features of Standard plus the ability to leverage private content in a dedicated instance.